Except for few very lucky folks, we all have issues with the health and growth of our hair. We often complain about the thinness of hair and weep that they no more look glossy, shiny and healthy. Well, it’s because we don’t understand that our hair needs food too to progress. 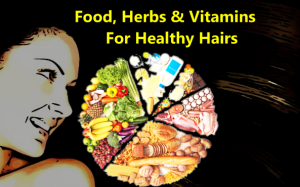 Apart from healthy food intake, there are certain herbs and vitamins that you must intake for a good healthy hair. Every single person lacks at least one vitamin at minimum that makes hair look unhealthy, dull, dry, and damaged with split ends, etc. Following are some vitamins, herbs and healthy food items that can help you have good healthy hair. You hair craves for healthy food. Healthy food is the one that is rich in nutrients. Taking a healthy nutrient rich diet can make your hair incredibly healthy. Following are some items that you must take in your diet for healthy hair growth. Almond butter-thickens your hair, increases hair growth by 42% approx. Amla berries-gives shine to hair. Hair needs food. Vitamins are the very first ones to work for your hair. Human body often lack following vitamins that results in poor condition of hair. People facing bad hair periods and extreme hair loss are recommended to consult a nutritionist to trace the vitamin that is deficient in their body. You may then take them in your diet or there is an option of supplements as well. Biotin and vitamin B-5(PANTOTHENIC ACID) are the very first ones to increase your hair growth and prevent hair loss as recommended by expert nutritionist. People often face sudden hair fall because of deficiency of these vitamins. Reasons are vast. It may be smoking, excess heat exposure, pregnancy, over-shampooing, etc. Biotin works to strengthen your hair, rebuilds, volumize them and stops hair loss. Vitamin B5 works for adrenal glands and hair fibers. It stimulates the hair growth experts also says that it may help with the hair pigmentation as well. You may find them in goat milk, halibut, Swiss chard, egg, avocado, nuts, potatoes and few more things. Every third person faces iron deficiency. It contributes a lot to hair fall. To accelerate your hair growth and prevent hair loss, iron in diet is one necessary intake for you. Eating plenty of egg yolks, collards greens, navy beans, black beans, spinach, etc. will overcome your hair loss associated with iron deficiency. Serious anemic patients are recommended to have egg yolk on daily basis for a better hair growth. Vitamin D is basically a hormone that is deficient in almost every single person. Sometimes, excess lacking of vitamin D effects the hair follicles and disturbs your hair growth cycle. It reduces the efficiency of the root cells of your hair and ceases your hair to grow and they may seem dead and unhealthy. Vitamin D is highly rich in sun light. Your daily 10-15 minutes exposure to sunlight in early morning may cure this deficiency. Another way is to intake vitamin-D rich food i.e. white fish, mushrooms, halibut, mackerel, sword fish, etc. People are often found with deficient vitamin B12 in their bodies. This deficiency prevents your hair to grow with a good pace. You may have it as recommended by your doctor since it’s available in three forms. You can have its supplements, shots, or else you can find it in egg yolks and grass fed beef. After vitamins, herbs are another source to improve the health of your hair. Following are some common ones that may help you deal with the hair issues. The supreme herb that you may take orally for the healthy growth of your hair is horsetail. It has silica the nutrient. This herb works not only for hair growth but for all basic aspects that makes your hair healthy. Firstly, it fortifies your hair growth, volumize them, reduces breakage of thin hair and gives your hair a shine. Oral intake of horsetail is very beneficial for healthy hair. Lavender is another herb that serves for the health of hair. It has the ability to convert dull rough dead hair into shiny glossy ones. You may apply lavender oil on scalp and massage once in month for a lustrous hair look. Rosemary is one popular and widely used herb for a healthy growth of hair. Hair health is often effected badly due to dandruff that is a common problem. Your hair starts losing their colour, becomes rough, breaking and then falling..
Use of rosemary oil can help you deal with itchy scalp and hair fall due to it. Try massaging it to your scalp in circulation motion twice a week. It will wash away dandruff and excess sebum from your hair and you will have healthy hair within a month. Aloe Vera is one herb that contains vitamins and minerals in itself. It has got excellent healing and antibacterial/anti-fungal properties to deal with unhealthy hair. Use of aloe heals the dead roots of your hair and eliminates dandruff as well. The aloe gel enzymes absorbs in scalp and eliminates the dead cells. Meanwhile, the dead tissues around the follicles regenerates and boosts hair growth. It also softens your hair. You may take it orally in the form of juice or apply its gel directly to your scalp and massage. After all, hair is what makes you look youthful so you must care about them. Healthy hair doesn’t come in a gift box. You need to work for it. Healthy intake makes healthy hair. best way to have healthy hair is take healthy diet as mentioned above and incase after that if you still find your hair unhealthy then do consult a nutritionist for the right use of herbs and vitamin supplements.